GloriaMaris the Chinese Cuisine restaurant is celebrating the month of September as Mooncake Festival for 2013. 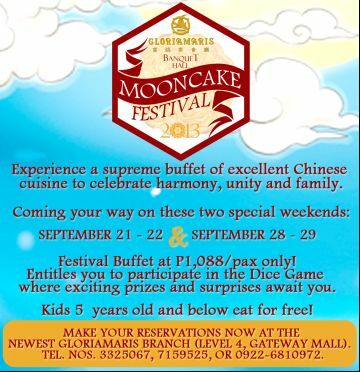 They’re offering supreme buffet of Chinese cuisine this coming September 21-22 and September 28-89, 2013. The festival buffet is P1,088 per head and entitles you to participate in the Dice Game where exciting prizes awaits you. Make your reservations at Newest GloriaMaris Branch, Level 4, Gateway Mall at tel. nos. 332-5067, 715-9525 or 0922-681-0972.